A memoir of triumphant positivity and inspiring attitude, Stephen Doster’s Her Finest Hour is why memoirs are written: to tell a true story of those individuals who don’t get the worldwide acclaim and respect that they so obviously deserve. It’s the genre that belongs to the unsung heroes, to which Terry Smith of Doster’s book belongs. Still alive to see her spectacular and riveting memoir published, Terry Smith is the epitome of a good person. Joining the Women’s Auxiliary Air Force in London as teenager, she saw her life take her to unimaginable places doing extraordinary things. She acted in Operations Rooms for the Royal Air Force, was an Air Traffic Controller, and even became one of the first female flight attendants in the British Overseas Airways Corporations, now known as British Airways. But what makes this memoir so special is that it is a faithful transcription of Terry Smith’s own actual words. There is no twisting of the truth or the worry of things being lost in translation. What Smith has said is what is printed within these pages, giving her story a depth that is often lacking in most books of this genre. With every predicament that Terry Smith finds herself in, there is an undeniable willingness to become better, to do better. The memoir covers Smith’s life quite literally. From her family being bombed several times during World War II, to the terrible incident of her fiance being murdered fighting in North Africa, Smith’s attitude of resilience and positivity is both provocative and inspiring. I couldn’t shake the hope and good intentions that this woman, through life’s proverbial ups and downs, wore like a badge on her arm, bright and shiny for the world to see. 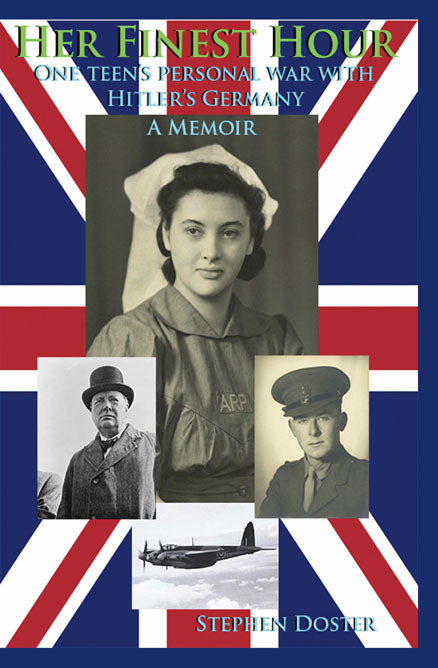 Second World War memoirs from British servicewomen are comparatively rare but Stephen Dosters’ compilation of the memories of his now 91 year-old mother, Marjorie Terry-Smith, is a valuable contribution to making up that deficiency. The book covers the first 30 years of her life including memories of a middle class childhood growing up in Britain between the wars and her experiences as one of Britain’s first stewardesses aboard BOAC after the War. The bulk of the book though, deals with her wartime experiences and the section devoted to this period is a treasure trove of anecdotes packed with incident. Dramatic, humorous, romantic, tragic and simply bizarre episodes tumble off the pages. The nonchalant way in which the Terry-Smiths learned of the outbreak of war is a timely counter to the stereotyped image of the British family huddled grimly around the radio. Her startling confrontation with Winston Churchill is a real gem. Bombed out of her family home (twice!) ‘Terry’ as she was known to friends and colleagues, joined the WAAF aged 17 and served in the operations rooms at several airfields around England during the Battle of Britain and then right through the War up to the frustration of being ‘demobbed’ in its aftermath. This book, told unvarnished in the first person, is a must for anyone wishing to get a woman’s perspective on the Second World War and a rare testimony from the ‘lower ranks’ of the British armed forces. Her Finest Hour by Stephen Doster is the best gift a son could give his mother, a memorial of her life; one that women and men should honor. She did anything and everything, saying, “Well, I’ve never done that before.” She volunteered at the hospitals, was a WAAF during WWII and accomplished so many things cutting-edge for women of that day: worked in RAF (Royal Air Force) Operations Rooms, was an ATC (Air Traffic Controller), volunteered to do assignments no one else dared simply because she had never done them before, and, after the war, she was one of the first female flight attendants for the BOAC (British Overseas Airways Corporation), now known as British Airways. I am in awe of her and thank Stephen Doster for being such a wonderful son.